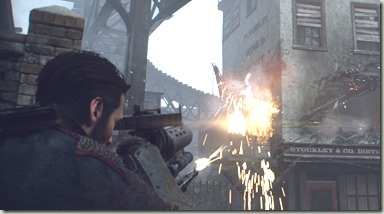 Wrapping our PAX Prime 2014 reports is The Order: 1886 - out today for PlayStation 4. One of the more compelling shooters we've laid our hands on, it neatly blends historical fiction with some wicked cool weapons. Learn about some of the design decisions that shaped this interesting game. You can download Busy Gamer Nation on iTunes, Zune, or our own RSS feed. This is at long last the final entry in our PAX Prime 2014 coverage. Next up: We have some surprises in the works, some of which have been on the back burner for a very long time. Stay tuned for awesome content you won't find anywhere else! Gamewatcher, have you spent any time playing this? I am hearing very mixed reviews, but a common theme appears to be that the story is convoluted. I am waiting for dust to settle, but a bit disappointed as I thought this was going to be one of my few purchases for PS4. This page contains a single entry by Gamewatcher published on February 19, 2015 9:57 PM. Busy Gamer Nation #230 - Boo Bunny Plague was the previous entry in this blog. Getting Started with... Marvel Puzzle Quest is the next entry in this blog.